Video clip synopsis – Early morning at an almost empty Bondi Beach. Rubbish is removed by local council workers and volunteer lifesavers check their gear, allocate safe surfing areas, and practise their lifesaving skills. Broadband MP4 surf_bb.mp4 (5.4MB), suitable for iPods and computer downloads. Bondi Beach in Sydney is one of Australia’s most famous beaches. The beach, roughly a kilometre long, is enclosed at the north and south by headlands. Every day of the year lifesavers patrol the beach between the yellow and red flags. They are volunteer workers. In summer it is very crowded. The beach also attracts a lot of tourists. Sometimes tourists don’t understand the meaning of the flags. Nor do they realise there are dangerous currents and rips where the flags are not placed. Other swimmers may be aware that the beach has dangerous currents but they do not know how to read the sea and manage the situation if they get swept out suddenly by a rip. 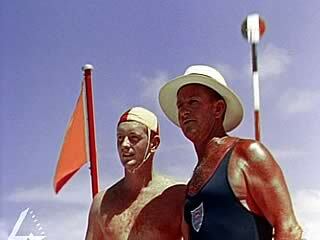 Bondi Beach needs its surf lifesaver patrol. List all the jobs and training lifesavers do. Lifesavers are volunteers. Give reasons why you think they undertake this work. An ‘icon’ is an object, image or figure that represents something special or sacred. Bondi Beach is sometimes considered to be a Sydney icon. Write a brief explanation of why it might be considered an icon. Carry out a survey in your class of who is a ‘volunteer’, or has someone in their family who volunteers. Discuss and five list points for each of the following questions; Why do people volunteer? Who benefits from volunteers? What qualities do people who vounteer need to have? Choose a person, place or thing in Victoria that is considered to be an icon. Write a 350-word letter or email to a friend overseas in which you describe what this icon is, why it is considered an icon and what it means to Victorians. Draw up a table with two columns headed, ‘Beach then’ and ‘Beach now’. Brainstorm and fill in the first column withevidence fromthe video clip. Fill in the ‘Beach now’ column using your own knowledge. Underneath the columns, list five points describing how people’s behaviour and attitude towards the beach has changed.